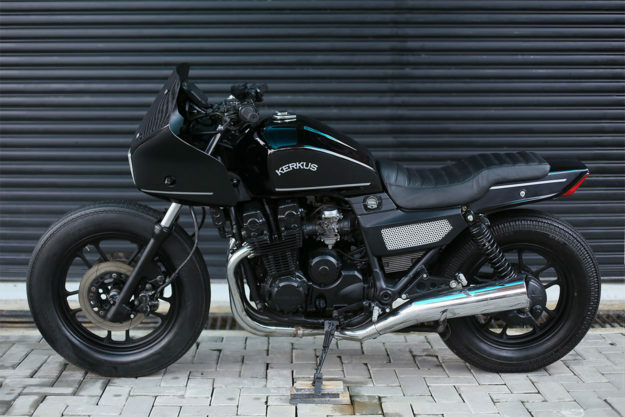 Unlike its famous cousin the CB750, the Honda CBX750 is a bit of a sleeper. But it does have a very unusual claim to fame: it was the motorcycle of choice for highway patrolmen in several countries. Honda even built a police-specific version of it. One of those countries is Malaysia, home to Kerkus Motorworks. Founders Azahar and Raveen have swung spanners on the CBX750 before, a process that usually involves shedding as much of the original styling as possible. But this new project called for a different approach. 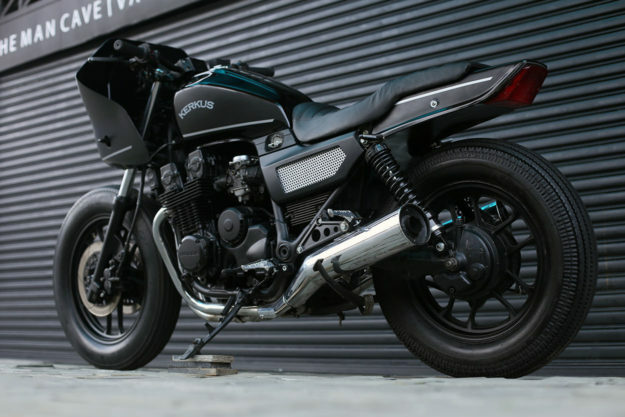 The owner of this stealthy CBX750 is the son of a policeman, and he developed a passion for the model as a child. 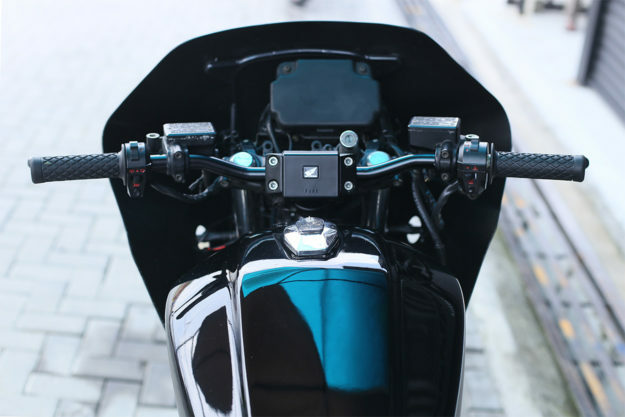 His father bought the bike at a police auction, and it eventually made its way into Kerkus’ Kuala Lumpur workshop. 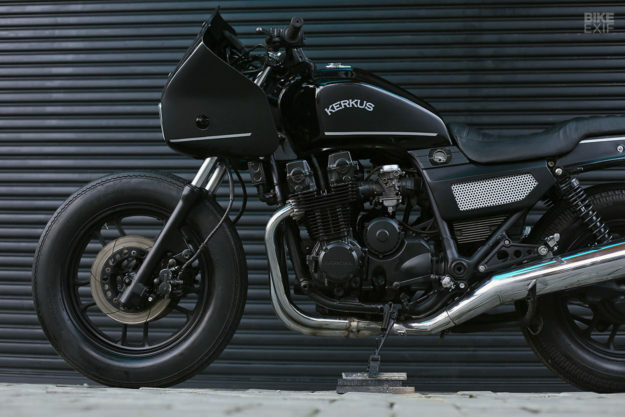 Despite his affinity for the CBX, Kerkus’ client had no preconceived idea of what he wanted. 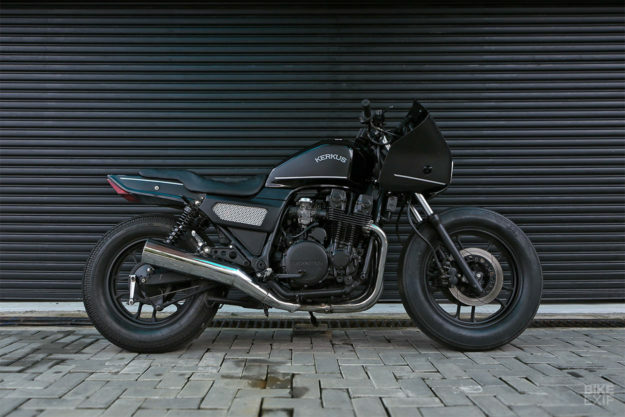 So Azahar and Raveen made the call themselves; the bike would retain as much of its DNA as possible, with maximum refinement. 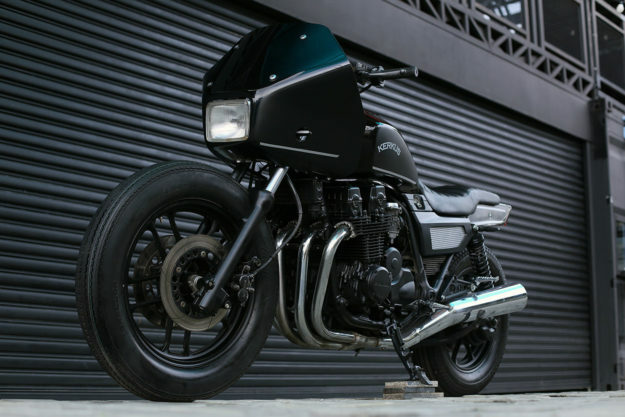 It would be a restomod homage to both dad and the legacy of the police-spec CBX. “We wanted his dad to see that custom bikes are not just about breaking the law, and more of an art form than a hoon,” the guys tell us. But before Kerkus could get busy, the extremely battered police motorcycle had to be brought up to spec. The owner took it straight to the official police maintenance division, who got it running and roadworthy. With the bike back at HQ, they faced another problem: a full workshop. Not wanting to turn their customer away, the guys partnered up with Izwan from DI-Motorsport. Kerkus would handle design, parts and project management, and Izwan would help with the heavy lifting. 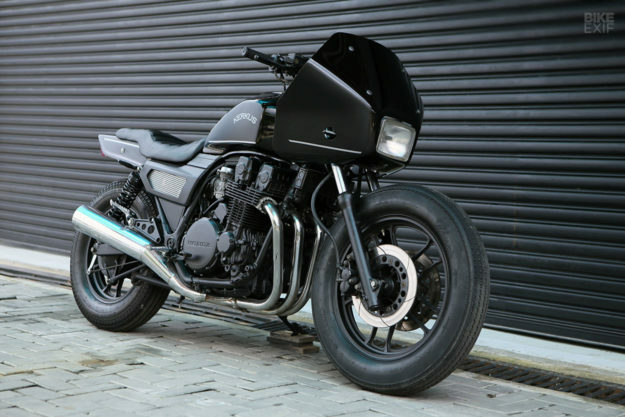 The biggest challenge was to keep the CBX750’s iconic fairing, tank and tail section, yet make them all look better. So the crew stripped the bike down to the frame, and started figuring out the lines. What came next was a whole lot of massaging. The original fairing was trimmed, then lowered to match up with the bottom edge of the fuel tank. 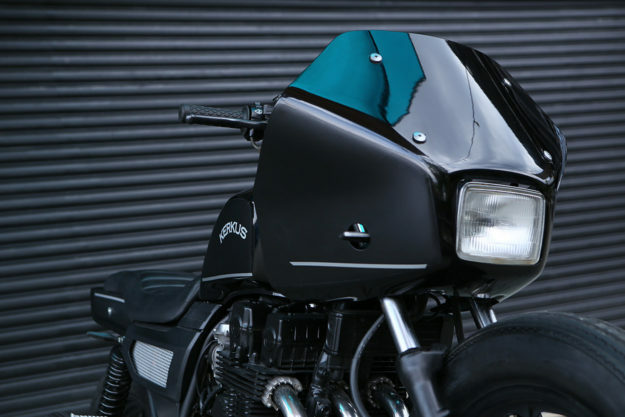 That meant modifying the fairing bracket too, and remounting the original rectangular headlight—a trademark of the police-issue CBX. The tank was also lifted by an inch to help even out the flow of the bodywork. Out back, the subframe was shortened, and the OEM tail section—complete with blocky taillight—was trimmed and brought in tighter. Local company Has Cushion was tasked with building a new two-up seat, which is now upholstered in Nappa leather. Lower down, the stock side covers were cut, reshaped, and treated to cutouts with mesh inserts. Moving to the cockpit, the crew ditched the high, swept-back handlebars for a sleeker set of black tracker-style bars. 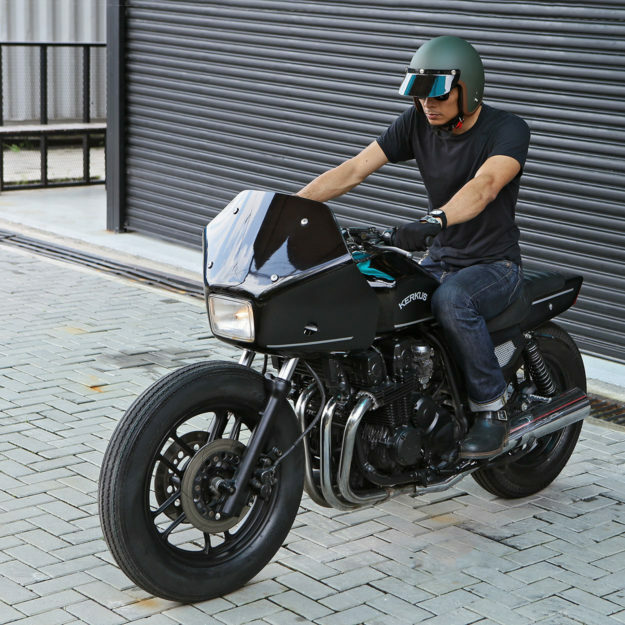 They’re wearing Biltwell Inc. grips and new switchgear. 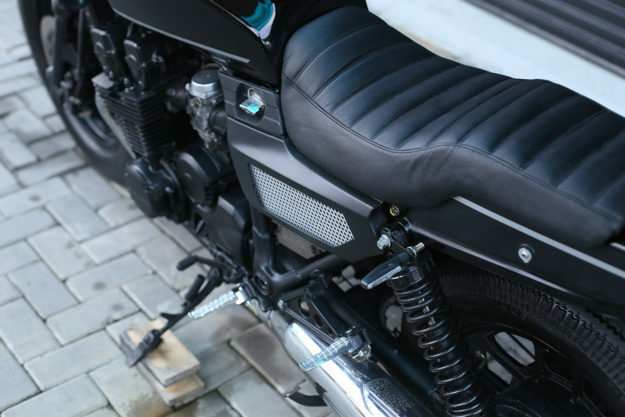 The police motorcycle’s bulky instrumentation is gone too, but the factory fuse box is still in its stock position—on top of the handlebar clamps. A full set of LED turn signals adds a modern touch. One of the saving graces of the police version of the CBX750 is that it was equipped with an 18” front and 16” rear tire—not the goofy 16F/18R setup that some iterations of the CBX came with. So Kerkus simply fitted a set of classic treads, without the need for any extra fettling to balance the stance. When it came to paint, Azahar and Raveen literally flipped the script. “As usual, we love to toy with black and monochrome colors,” they explain. So they treated the motor to a black satin finish, and polished the CBX’s original four-into-two exhausts to get them back to their original luster. The bodywork was painted in jet black, with contrasting gloss and matte finishes. White striping and simple logos tie it all together. 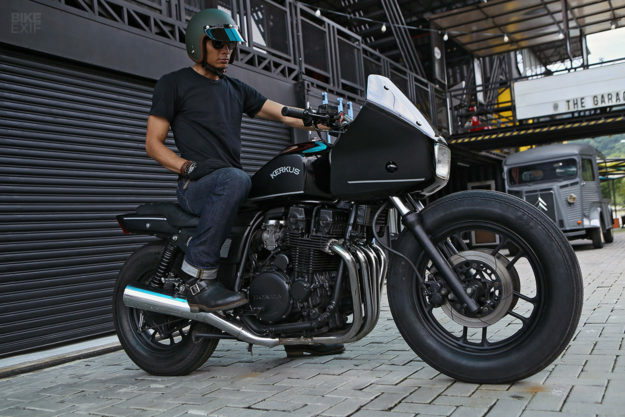 Kerkus and co. have transformed the CBX750 from cop bike into something an off-duty officer moonlighting as a vigilante would ride. And for that, we applaud them.